Why is presbyopia such a big deal? Currently, in Europe alone, there are around 340 million people over the age of 45 in need of some degree of correction for near vision1. Studies estimate that 1.8 billion people worldwide will be presbyopic by 20501. However, considering contact lens wear, presbyopia tends to increase patient dropout. For most eye care professionals, the problems associated with multifocal contact lenses are obvious: reduced contrast sensitivity, undesirable ghosting and diminished low-contrast visual acuity, engendered by a well-known set of factors, including the centration, design and near add power of the contact lens, as well as to the patient’s spherical aberrations and pupil size2. Fig. 1: Factors affecting multifocal contact lenses performance. 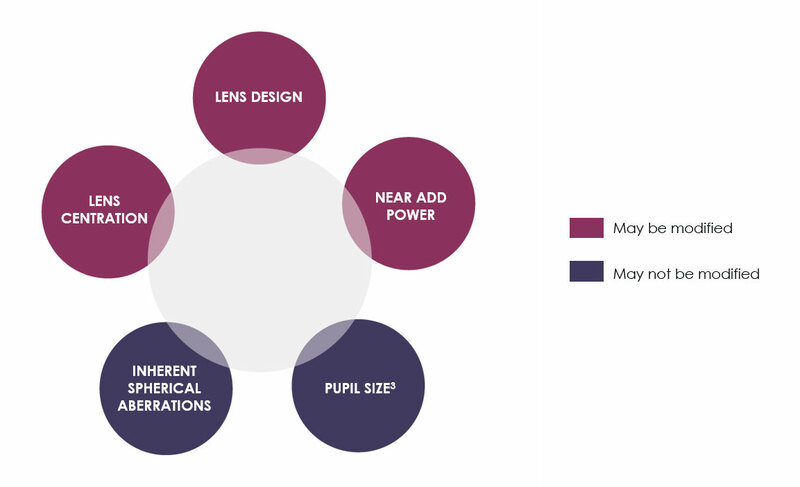 Despite these issues with multifocal contact lenses being common knowledge among professionals, it remains a challenge for even the most experienced fitters to stop their patients from complaining and ultimately dropping out of their lenses due to inadequate vision. 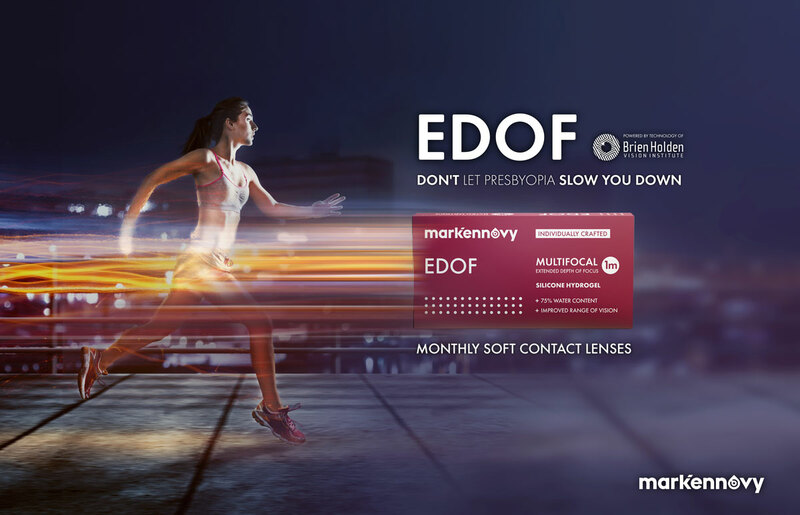 mark’ennovy, leading independent provider of precision contact lenses, and the Brien Holden Vision Institute, world-renowned non-profit organisation for innovative vision care solutions, have teamed up to develop EDOF, a brand-new soft contact lens for presbyopes. The monthly individually crafted silicone hydrogel lens, powered by the Brien Holden Vision Institute’s patented Extended Depth of Focus technology, is positioned to take on the shortcomings of other multifocal soft contact lenses. Fig. 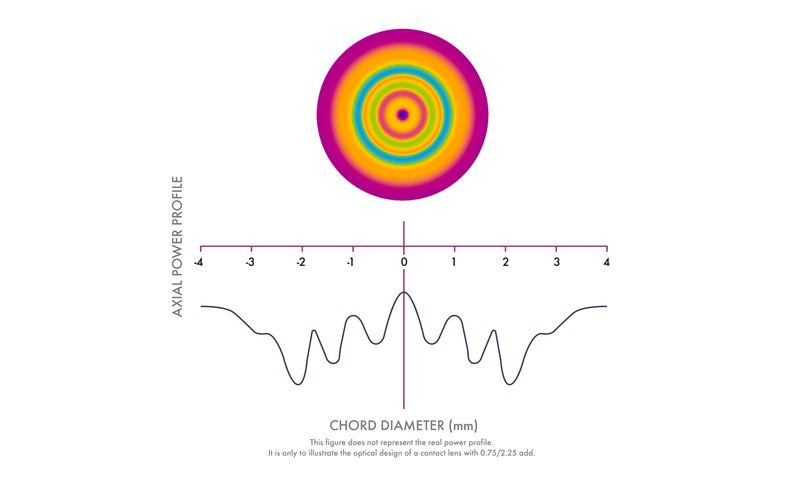 2: Illustration of a representative optical design for an EDOF contact lens for presbyopia. “The Brien Holden Vision Institute’s patented technology supports a comfortable adjustment to the EDOF, enhancing the overall wearing experience,” states Neil Goodenough, mark’ennovy’s Group R&D Director. EDOF comes to market alongside MYLO, a new soft silicone hydrogel lens specifically for Myopia Management, also powered by the Brien Holden Vision Institute’s patented Extended Depth of Focus technology. Both lenses are now available in a wide range of powers, diameters and base curves. Practices interested in learning more about mark’ennovy soft contact lens for presbyopia can contact their Business Development Manager or our Customer Care team at 0800 328 0610.
mark’ennovy is dedicated to innovation and a forward-thinking approach towards the evolution of the contact lens industry. mark’ennovy’s product portfolio is one of the most extensive available on the market in the world with an unrivalled combination of materials, replacements, parameters and geometries, catered exclusively to eye care professionals. The Brien Holden Vision Institute is a non-profit translational research, education and public health organisation. It develops new solutions for vision care, especially for myopia and other refractive errors to eliminate vision impairment and avoidable blindness, thereby reducing disability and poverty. 1. Holden et al. Global Vision Impairment Due to Uncorrected Presbyopia. American Journal of Ophthalmology. 2008;126(12):1731-1739. 2. Bakaraju, R. C., et al. 2018. Extended depth of focus contact lenses vs. two commercial multifocals: Part 2. Visual performance after 1 week of lens wear. Journal of Optometry, 11(1), 21–32.